Are you looking for delicious ways to incorporate more fruits and vegetables in your diet? Are you short on time but still want to put a healthy and satisfying meal on the table that your family will enjoy? 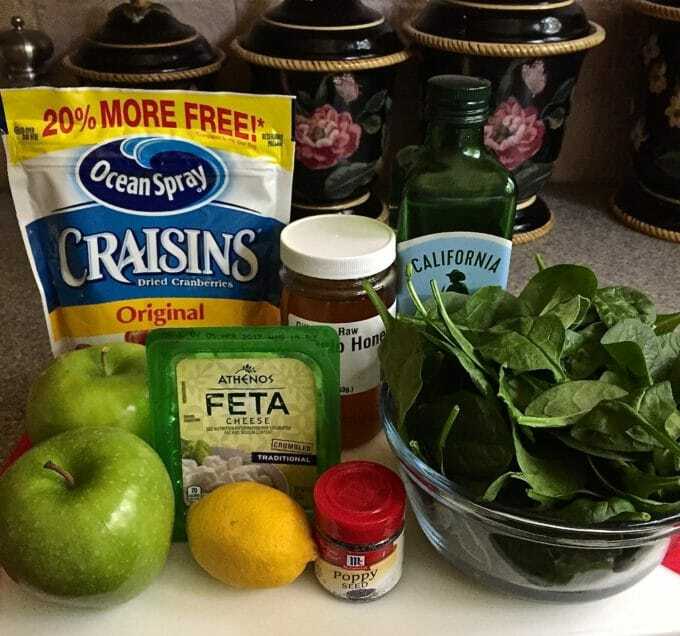 Today I have for you, easy and healthy, Spinach, Apple, and Cranberry Salad with delicious homemade Poppy Seed Dressing. 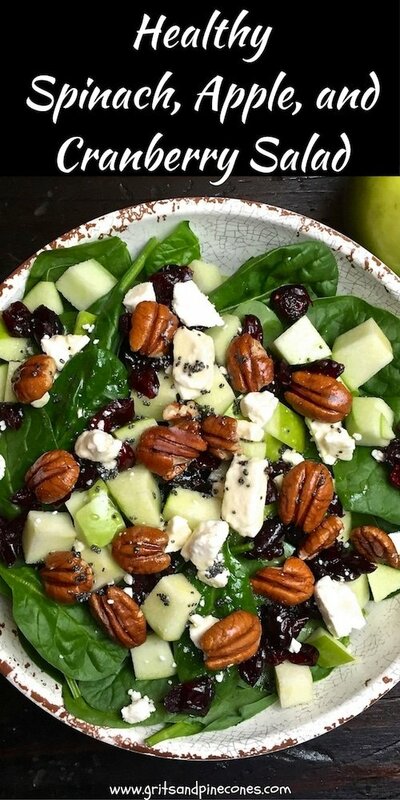 Spinach, Apple, and Cranberry Salad with homemade Poppy Seed Dressing is the perfect salad for you. Whether you serve this tasty, bright and colorful salad as an entree or a side dish, it’s low in calories, packed with vitamins and nutrients, and a delicious light change of pace. I’m embarrassed to admit that, as a rule, I don’t care for most cooked vegetables, particularly cooked leaves of any kind. This rules out cooked kale, spinach, turnip greens, and any other cooked greens for me. Yes, I know how healthy they are for you, and yes, I know how many servings I should have every day for optimum health. I do, however, love salads, with all sorts of lettuce, kale, spinach, etc., and lots of different fruit and vegetable toppings. Spinach, Apple, and Cranberry Salad is one of our favorites, and I’m sure your family will love it too! You can have this tasty, low-carbohydrate salad on the table in 10 minutes flat and, if you feel like you need something a little more substantial, you can always top it with cooked shrimp, chicken, or salmon. Oh, and did I mention it only has 277 calories per serving, tons of fiber and a whopping 24% of your daily Vitamin C requirement and 20% of your daily Vitamin A needs? Looking for other delicious salad recipes, your family will love? Check out my Easy Broccoli Slaw with Ramen Noodles, Mexican Chopped Salad with Honey-Lime Dressing or Corn, Tomato, and Avocado Salad. 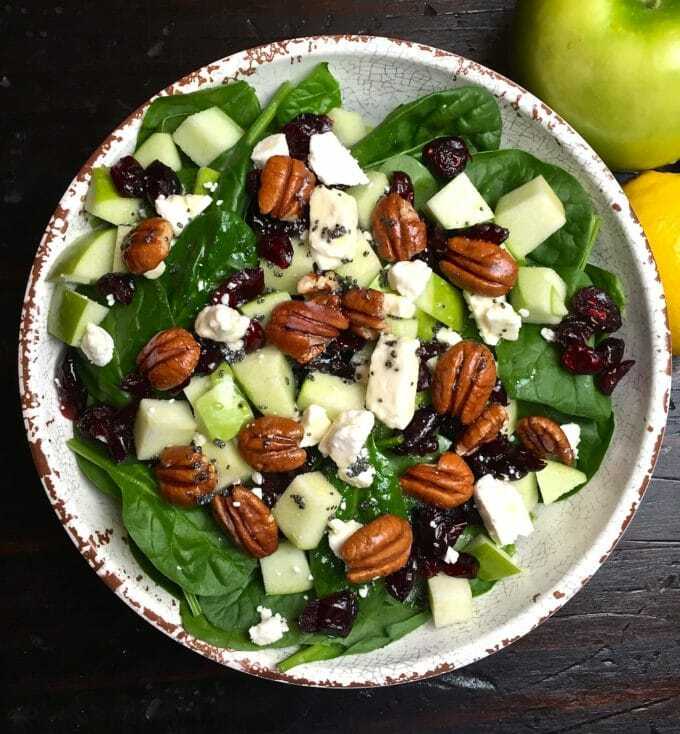 To make Spinach, Apple, and Cranberry Salad with homemade Poppy Seed Dressing, you will need baby spinach, feta cheese, Craisins or dried cranberries, blueberries or cherries, Granny Smith apples, and pecans. You can use purchased Poppy Seed Dressing, but this recipe is so easy and tasty I hope you give it a try. The dressing ingredients are honey, lemon juice, onion powder, garlic powder, extra-virgin olive oil, salt, pepper and poppy seeds. As with most salads, if you don’t have an ingredient, feel free to substitute whatever you do have or what you like; there are almost no rules with it comes to making delicious and healthy salads. And now for the easy part, making this yummy salad. There are only two steps after you have gathered your ingredients. The first put the spinach, dried fruit, apples, feta, and pecans in a large bowl. 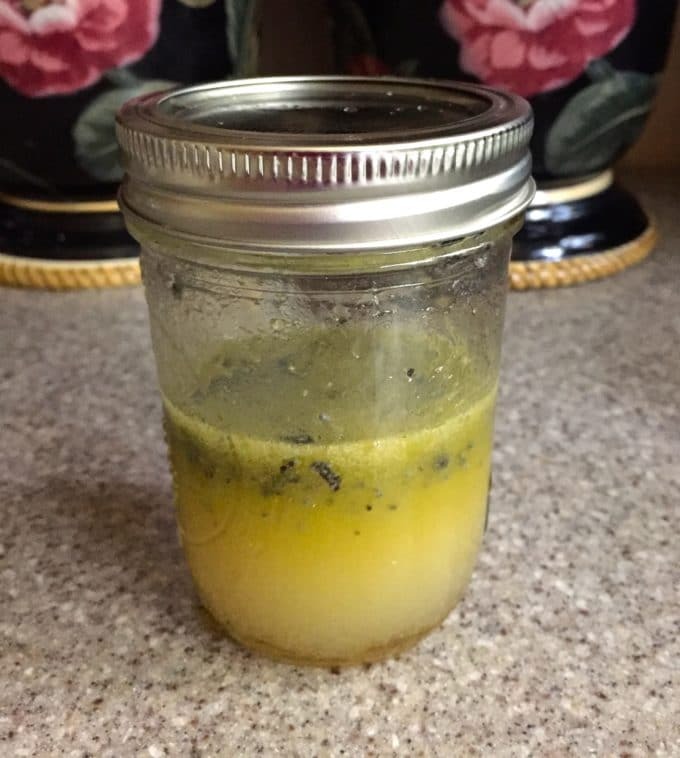 The second put all dressing ingredients in a small mason jar with a lid and shake well. That’s it! When you are ready to eat, top the salad with some dressing and toss gently. Serve immediately. Enjoy! Whether you serve Spinach, Apple, and Cranberry Salad as an entree or a side dish, it’s low in calories, packed with vitamins, healthy, and easy to prepare! Put all dressing ingredients in a small mason jar with a lid and shake well. Pour dressing over the salad and toss gently. Serve immediately. You will have extra dressing. Simply cover, refrigerate and use it on another salad. Your pizza with artichokes made with a can of crust was the best pizza I’ve had in years and so easy to make. Thanks for sharing. Thanks so much for letting me know Linda! I’m so glad you liked it! This looks so delicious and healthy!! Will try soon. Thanks for another great recipe. Thanks so much Mary! I hope you enjoy it!